Woodruff Place was the first “suburban” neighborhood in Indianapolis. Located just over a mile from downtown, the area’s significance lies in its unique character as a planned residential community created within a park-like atmosphere. Though not exactly a convenient location in 1872, (nearly an hour by wagon from the center of town), local advertisements were successful in attracting curious visitors eager to see what could possibly be so special about this place where the cost of a 40 x 80 foot lot exceeded a year’s wage. James O. Woodruff, a civil engineer from Auburn, New York, came to Indianapolis to direct completion of the city’s new waterworks. He was attracted to the quiet wooded location east of the city, purchased 77 acres, and began to develop his grand plan – a Victorian version of formal Italian Renaissance gardens. From the beginning, Woodruff’s development possessed all the requisites of a park: three boulevard drives bisected by grassy esplanades, spacious lots, picturesque homes, clusters of graceful cast-iron statues and costly multi-tiered fountains. A fence would surround the purely residential enclave and isolate it from what might come later on surrounding land. Such was the vision of James O. Woodruff when he laid out Woodruff Place in 1872-73. He built his own home on West Drive, but was unable to realize the completion of his dream community. The financial panic of 1873 hit Indianapolis hard, and James Woodruff was bankrupted. A few years later in 1876, a small group of initial property owners successfully petitioned for incorporation of the subdivision as a town, and thanks to a group of investors, Woodruff’s plans were carried forward into the next century. Though it grew slowly at first, Woodruff Place experienced a building boom during the 1890s as people discovered its restful charm. By the early twentieth century, Woodruff Place had earned recognition as a close-knit affluent community. Alleys lined by large carriage houses and servants’ quarters bisected lots along each drive. A variety of architectural styles are found in Woodruff Place. The most significant homes date from 1875 to 1917. This was a period of elaborate house design generally known as Victorian. The oldest surviving residence in Woodruff Place at 894 West Drive was constructed in 1875 and stands as an early example of Eastlake or Late Stick style. Throughout the neighborhood, there are many examples of Queen Anne style homes. Woodruff Place is also home to Georgian Revivals, English Tudors, Bungalows, American Foursquares, and Colonial Revivals. Following World War I, Woodruff Place experienced a decline as the population moved farther from the city to escape the noise and dirt. Further decline was experienced during the Great Depression. Many homeowners chose to divide their large residences into apartments to provide themselves with needed income, and to capitalize on the housing shortage after WW II. Woodruff Place’s town government succumbed in 1962 after a long court battle, the victim of soaring fire and police protection costs. The 1960s and 1970s brought the beginning of new life to Woodruff Place as an active Civic League stepped up with plans to preserve the community’s heritage. Woodruff Place joined with organzations such as Indiana Landmarks, Indianapolis Power and Light Company, and the City of Indianapolis to work on neighborhood improvement projects. Federal community and economic development grants also provided much needed revenue over the years. 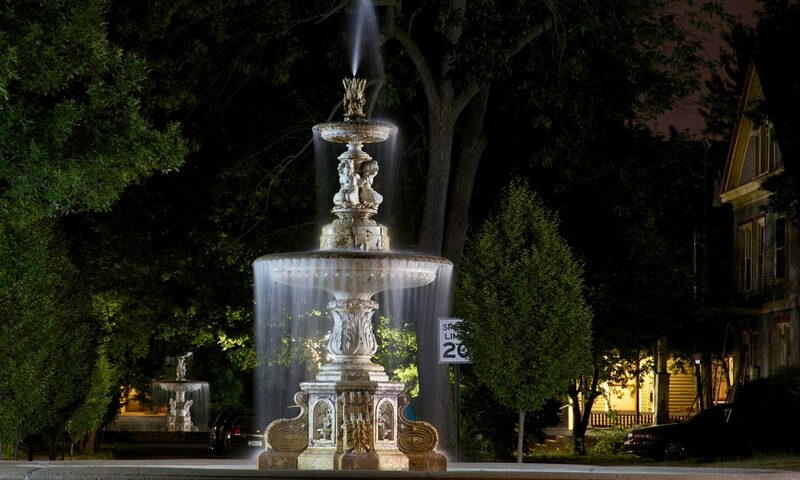 In 2000, due to budget constraints, the City of Indianapolis returned maintenance of Town Hall, esplanades, fountains, statuary, urns, and street lights to Woodruff Place. Through the years, Woodruff Place residents and property owners have always stepped up to provide their time, and money when needed, to preserve this unique community. Current “Woodruffians” will do no less. In 2001, an historic area preservation plan was adopted by the neighborhood. The plan’s aim is to aid property owners, the Civic League, and governmental agencies in preserving the remaining heritage in Woodruff Place. The plan offers guidelines to assist property owners, and addresses a full range of preservation and development issues.